The Behringer The X-LIVE interface card expands on the already stellar performance of the X-USB card that has been standard in X32 consoles for years. The same 32-channel bi-directional audio I/O via USB 2.0 is available, providing 32 channels for recording and playback, plus remote operation of your DAW via HUI/Mackie Control emulation. The addition of dual SD/SDHC slots provides fully independent recording and playback of up to 32 channels of uncompressed WAV files in consistent sessions – up to the maximum capacity of the SD cards. 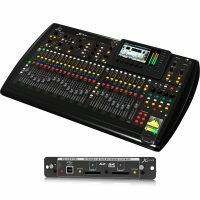 Multi-channel recording without a laptop, as well as virtual sound checks, live backing-track support, accurate marker handling and manipulation, and full remote operation from PC, Android* or iPad* apps and X-TOUCH control surfaces. All of this barely begins to scratch the surface of what X-LIVE can bring to your X32. The X32’s recording capability just got even more robust, thanks to the new X-LIVE Expansion Card and USB Audio/ MIDI Interface. Whether you’re multitracking your live performances directly to a PC/Mac, or to the flash media in your console, X-LIVE makes it easier than ever. 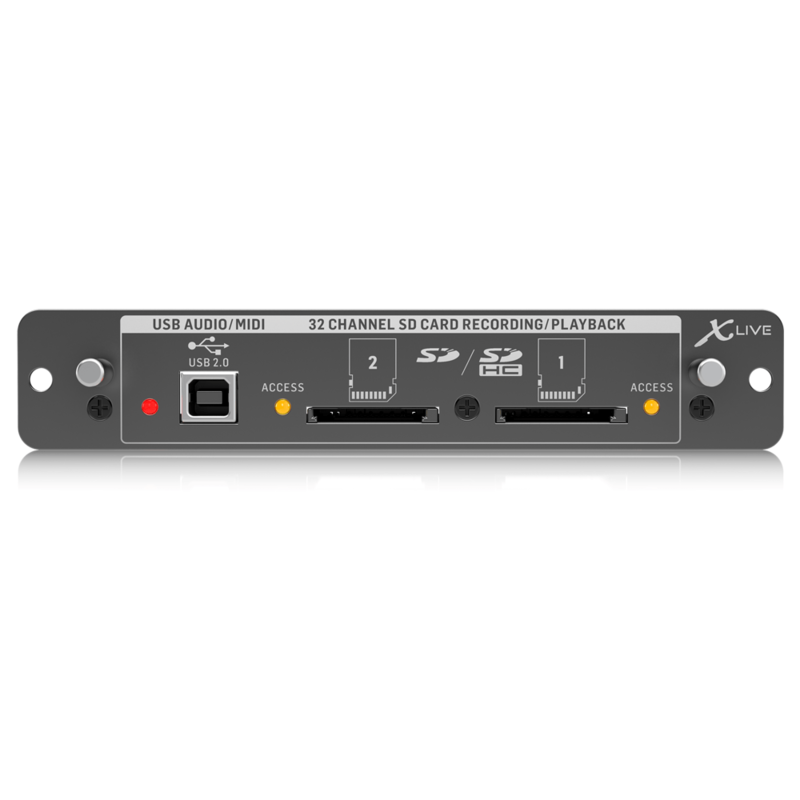 Equipped with dual SD/SDHC-card slots, X-LIVE provides uncompressed recording and playback of up to 64 GB of memory, enough to capture a 3 hour and 20 minute continuous 32-track session – all of which can be done without ever leaving the X32 environment. Just think about it, no external wiring or computer issues – everything you need is in a single location. 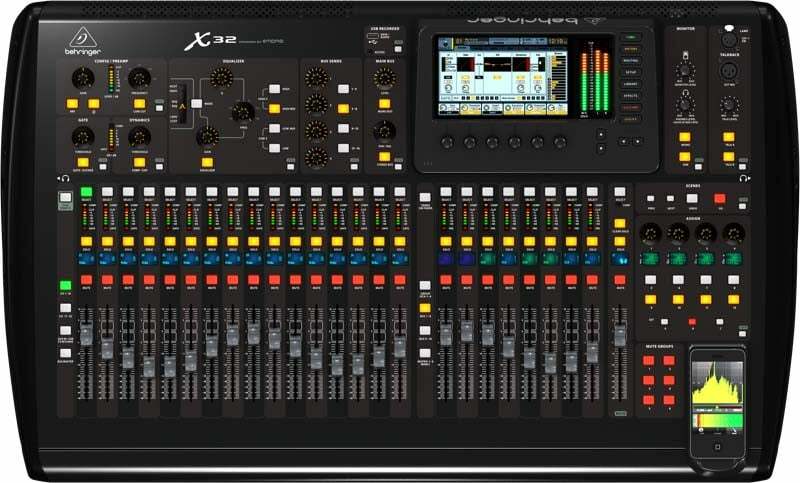 And X-LIVE is equally at home in either the recording studio or the performance venue. 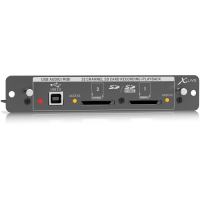 The Behringer X-LIVE USB and SD interfaces can be operated simultaneously and independently. For example, you may want to play back your recorded session from an SD card and record the tracks via USB into your favorite DAW for post-processing. Or, you might need to prepare live backing tracks in your DAW and then transfer them to an SD card in real time, while setting performance markers on-the-fly. You can even record using both the USB and SD simultaneously for redundancy. 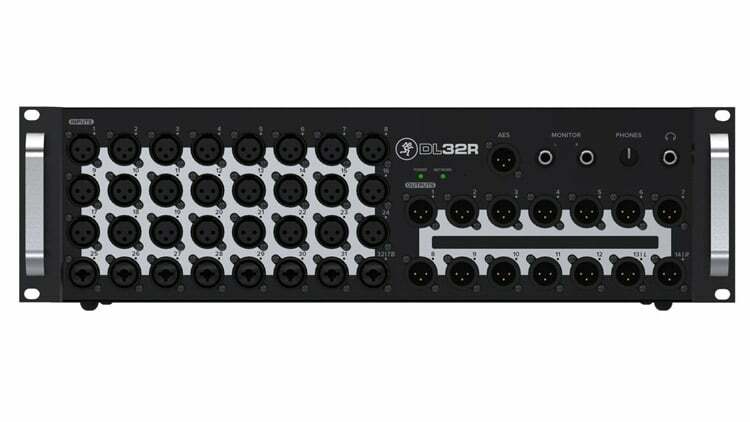 Best of all, these operations can be performed without routing tracks through your console channels, leaving the X32 completely free to craft the perfect FOH mix. 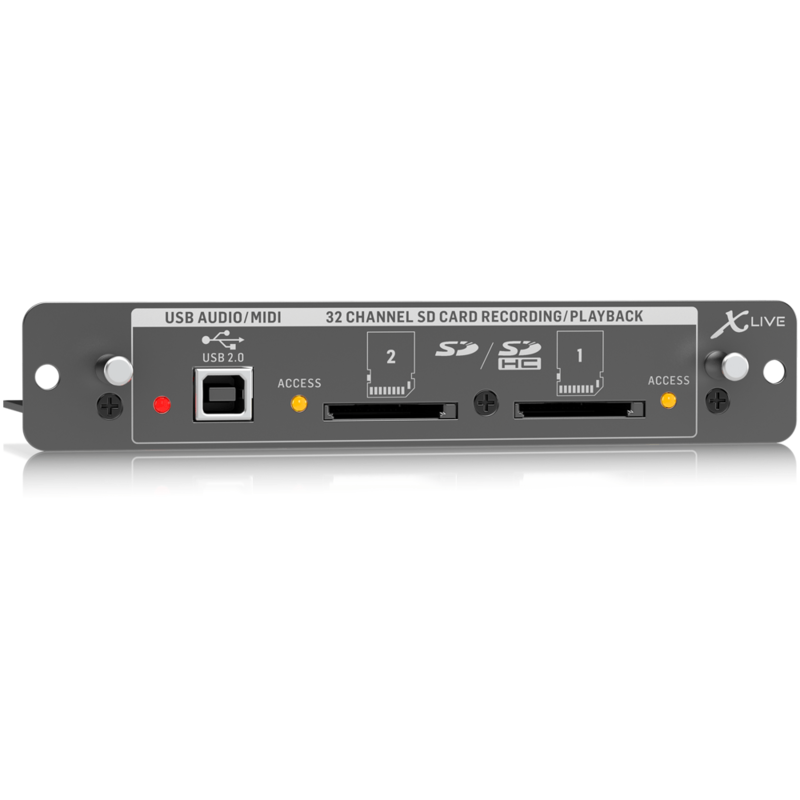 All of X-LIVE’s functionality and transport controls can be controlled remotely via PC, Android* or iPad* apps, assignable controls or compatible hardware control surfaces, such as the BEHRINGER X-TOUCH. This powerful tool lets you cue up and initiate backing tracks, start or stop recording/ playback, perform virtual sound checks and more – even when you’re away from the X32 console. 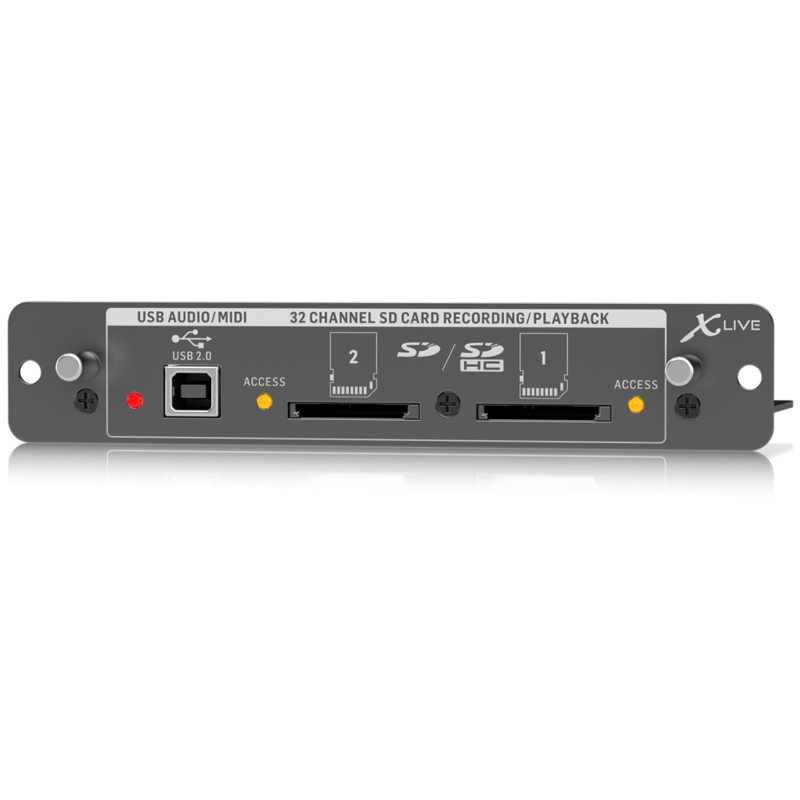 For optimal read/write performance on a huge variety of SD and SDHC cards, X-LIVE uses standard uncompressed 32-bit PCM format multi-channel WAV files. An X-LIVE recording session may consist of either one or several takes, and capture up to a maximum of 24 hours of consistent recording or playback. Multi-channel WAV files can be imported directly into most popular DAW applications, including the free open source audio editor Audacity. You can even export your 32-bit WAV files, which allows you to prepare backing tracks offline, such as when you’re away from your X-LIVE equipped X32 mixer.